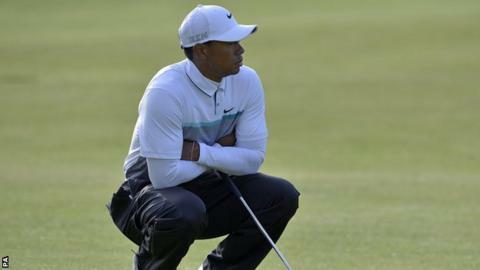 Three-time champion Tiger Woods says he will come back stronger after bowing out of The Open, missing the cut in two major championships in a row for the first time. Woods, 39, finished the weather-delayed second round with a three-over-par 75 for a seven-over aggregate of 151. "Next time it comes around, hopefully I play a little bit better than I did the last two times," he said. American Dustin Johnson has a one-shot lead at the halfway stage. The third round is due to take place on Sunday, before the final round on Monday. Fourteen-time major winner Woods's fate was sealed when he carded three straight bogeys from the 13th. The 2000, 2005 and 2006 Open champion also missed the cut at last month's US Open where he shot an opening round 80 followed by a 76. He never recovered at St Andrews from making four bogeys in the first seven holes on Thursday. "I only made three birdies in two days. That's not very good," added Woods, who has plummeted from number one to 241st in the world. "It was one thing after another. I had my opportunities, I just didn't get the ball close enough and then when I did I didn't make them." Woods, tied 147th in a field of 156, praised the 18th-hole ovation he received from the crowd that remained through a 10-and-a-half-hour suspension in play caused by high winds. "The people were fantastic," he said. "To stay out here all day and to have that kind of a warm reception is awfully special. "It's one of the things I was talking about with [playing partner] Jason Day, it's the greatest walk in golf. He said, 'Yeah, it's nice when you have an eight-shot lead too'." The Open is likely to return to St Andrews in 2020 and Woods added: "I'll probably have less hair then and hopefully a little better game."